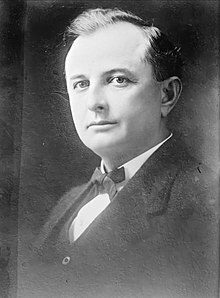 James Edward Ferguson Jr. (August 31, 1871 – September 21, 1944), known as Pa Ferguson, was an American Democratic politician and the 26th Governor of Texas, in office from 1915 to 1917. He was indicted and impeached during his second term and forced to resign. Later, after his wife Miriam A. Ferguson, known as "Ma" Ferguson, was twice elected as governor, he was the first gentleman of Texas for two nonconsecutive terms. Ferguson was born to the Reverend James Ferguson, Sr., and Fannie Ferguson near Salado in south Bell County, Texas. At age 12 he entered Salado College (a preparatory school) but was eventually expelled for disobedience. At 16, he left home and drifted through the states of the American West, working successively in a vineyard, a mine, a barbed wire factory, and at a grain ranch. After he returned to Texas, he studied law in Bell County and was admitted to the bar. On December 31, 1899, he married Miriam A. Wallace at her family home. In 1903, Ferguson was elected as city attorney in Belton, Texas. In addition, he established Farmers State Bank. In 1906, he sold Farmers bank and established Temple State Bank. He also became active in the Democratic Party and managed several local political campaigns. In 1914, Ferguson was elected as governor of Texas by running as an anti-prohibitionist Democrat. He served from January 19, 1915 to August 25, 1917. After being re-elected in 1916, Ferguson vetoed the appropriations for the University of Texas. The veto was retaliation against the university because of its refusal to dismiss certain faculty members whom Ferguson found objectionable, including William Harding Mayes, former Texas Lieutenant Governor and founder and dean of the University of Texas School of Journalism. He had been an opponent of Ferguson for the Democratic party's nomination for governor in 1914. The accusations against Mayes were that he used his ownership of newspapers, including the Brownwood Bulletin, to spread negative information about Ferguson. Another leading Ferguson critic on the UT campus was the historian Eugene C. Barker. Ferguson's attack against Mayes resulted in a drive by the legislature to impeach Ferguson. The chairman of the investigating committee, William H. Bledsoe of Lubbock, called for impeachment. Ferguson was indicted on nine charges in July 1917. The Texas House of Representatives prepared 21 charges against Ferguson, and the Senate convicted him on 10 of those charges, including misapplication of public funds and receiving $156,000 from an unnamed source. The Texas Senate, many of whom had served under William Harding Mayes and with whom Mayes maintained cordial relationships, removed Ferguson as governor and declared him ineligible to hold office under Texas jurisdiction. But Ferguson ran for governor in the 1918 Democratic primary. He was defeated in the Democratic primary by his successor and incumbent, William P. Hobby of Houston, previously the lieutenant governor. Ferguson also ran for President of the United States in the 1920 election as the candidate of the American Party. Ferguson was on the ballot only in Texas, where he received 47,968 votes (9.9 percent of the vote in Texas, 0.2 percent of the vote nationwide). The 1920 presidential election was won by Republican candidate Warren Harding. Democratic nominee James M. Cox won in Texas, where the white majority was voting solidly Democratic. Eugene Victor Debs of the Socialist Party of America. Parley Parker Christensen of the United States Farmer-Labor Party. Aaron Sherman Watkins of the United States Prohibition Party. Ferguson failed at his bid for the United States Senate in 1922, having lost in the Democratic runoff election to Earle Bradford Mayfield. In 1924, Ferguson entered his wife Miriam in the Democratic gubernatorial primary. She won that and the general election, saying that she intended to rely on her husband for advice. With Nellie Tayloe Ross of Wyoming, "Ma" Ferguson became one of the first two female elected governors in the United States. Both women followed husbands who had served earlier. Nellie Tayloe Ross was the first woman to assume the office of governor in the United States, being sworn in on January 5, 1925; Miriam Ferguson followed on January 20. She served two nonconsecutive two-year terms as governor: January 20, 1925 – January 17, 1927. She was reelected in 1932 and served January 17, 1933 – January 15, 1935. In 1935, the Fergusons lost their ranch in Bell County because of financial troubles during the Great Depression. Nine years later, Ferguson died of a stroke. He is interred next to his wife at the Texas State Cemetery in Austin. ^ "Ferguson, Miriam Amanda Wallace". The Handbook of Texas Online. Texas State Historical Association (TSHA). ^ "Ferguson, James Edward". The Handbook of Texas Online. Texas State Historical Association. 2010-06-12. Retrieved 2012-03-31. Luthin, Reinhard H. (1954). "Pa & Ma Ferguson: Texas". American Demagogues: Twentieth Century. Beacon Press. ASIN B0007DN37C. OCLC 1098334.